Beep Box Midi Music Maker, say that five times fast. I don't know how to make music, but when the only person you can hire to make your game is yourself BeepBox is a tool that gives you the ability to help yourself. You see, BeepBox is kind of like training wheels for a tuba. When you have all the mice and men making electronic dance music you think, how hard can that be, then you try it yourself it sounds like a pile of poo. Anyways, what I was saying was that BeepBox is the place to go for making simple tunes that add a lot of color to your game. Easy to get something sounding good and I'm sure for more advanced users it offers depth to make more complicated music. I wouldn't know because I'm not an advanced user, but who is really. If you give it a try yourself, you'll see you can add notes at different points. Yadda yadda yadda. Like I said I don't know how to make music, but open it up and start clicking away and you'll see how fun it is and how great your songs sound. After all, they say even a monkey can write Shakespeare when given enough bananas and time. 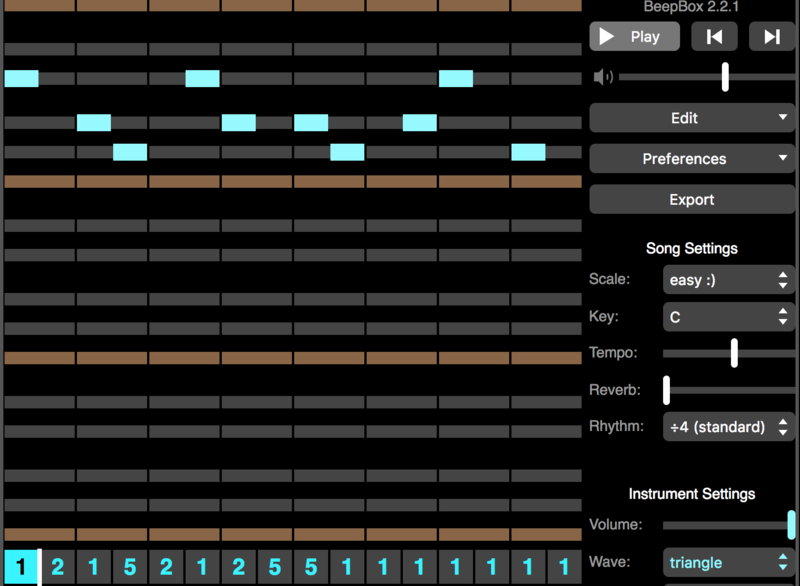 Now, there are obviously a ton of other tools you can use to develop game music and if you've played with electronic music at all you probably know a handful of other tools, likely better than BeepBox, that you can use. I expect that anyone that spends a few hours with any one of these tools just to learn the basics can at least make a passable soundtrack. Obviously, you see what I've created and you can be the judge of it, but I tend to think that this is something that can be kept simple to start with unless music making is a solid skill of yours. Feel free to change it and make it better if you want, drop an email to Mr. Balling in the Contact Us section if you create a master piece.